The seven Medicine Buddhas, attainers of bliss, strongly prayed for the temporal and ultimate happiness of yourself and all sentient beings. They vowed that their prayers would be actualized during these degenerate times when the teachings of Shakyamuni Buddha are in decline. As the buddhas’ holy speech is irrevocable, you can wholly trust in their power to quickly grant blessings to help all sentient beings in these degenerate times. 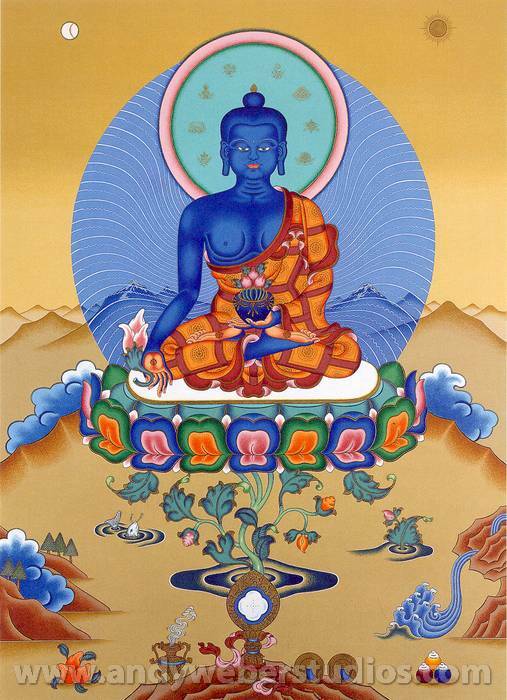 If you pray to Guru Medicine Buddha, you will quickly accomplish all that you wish. Just hearing the holy name of Guru Medicine Buddha and the sound of his mantra closes the door to rebirth in the suffering lower realms. It is written in the scriptures that you should not have a two-pointed mind (doubt) with regard to these benefits.